Accubanker D-63 Ultraviolet Counterfeit Detector can be use over counter at point of sale. 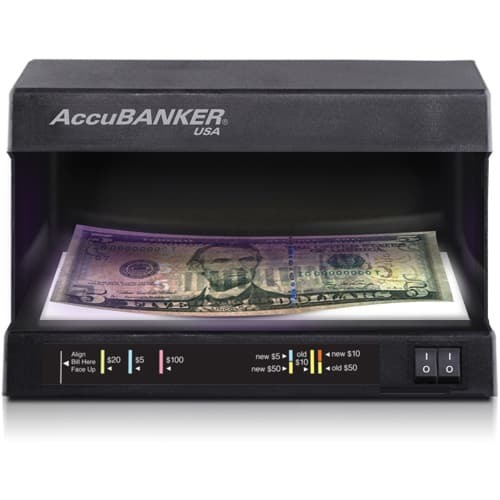 The Accubanker D-63 is a UV Light or Black Light box use to check printed UV marks on Currency, ID cards, Driver License, Passport and checks to identify the authenticity of most documents with uv printing. It works well. I had one of this same one before which last me about 7yrs. So when I saw this brand, I had to those this over others because I know that this is good quality. works as intended to. make sure you tell whom ever uses it to turn off the lights after each use. I bought this counterfeit detector for my father's business because he would get false bills and wouldn't notice so he would deposit money to the bank without noticing he had false bills. The bank told him he had false bills and he was scared because my father is a business man and wants no problems with the bank. Ever since i bought him this product he has not once gotten a false bill mixed into the money he deposits to the bank. This is well made, UV light shines bright and it is powered by plug, not batteries. I highly recommend this product to anyone who's looking for a way to negate receiving false bills.